‘보그 인터내셔널 에디터’ 수지 멘키스는 세계에서 가장 유명한 패션 저널리스트다. 담당한 그녀는 현재 세계 각국의 ‘보그닷컴’을 위해 독점 취재 및 기사를 쓴다. 그것은 모든 규칙을 위반했다. 연약한 몸매에 커다란 어깨, 여우나 흑담비 모피로 만든 부푼 소매, 나방, 쥐, 다람쥐 같은 하찮은 생명체 그림, 그리고 쇼킹 핑크 벨벳이 살짝 들어간 실크 드레스에 사용된 기이한 색조들. 바로 마르코 자니니가 부활시킨 엘자 스키아파렐리 컬렉션이다(페미니스트 관점에서 본 30년대 40년대 여성들에 대한 평가). 그건 믿을만하고 매력적이며 때론 사랑스러웠다. 그리고 지난 시즌 데뷔 무대의 애니멀 프린트의 앵클 플랫 부츠에서 크게 발전했다. “그건 파리지엔 시크에 대한 개인적인 생각이에요”라고 자니니는 ‘스키압’의 세련된 안목에 대한 자신의 생각과 여성들에게 개성을 드러내도록 용기를 주려던 그녀의 야망에 관해 설명했다. 모든 것이 이브닝웨어에서 아주 효과적이었다. 자니니는 이브닝웨어에 강한 듯 보였다. 수국 핑크와 쥐색이 섞인, 몸 위로 액체처럼 흘러내리는 새틴 드레스, 혹은 빠르게 걸어가는 다람쥐 프린트가 들어간 바이어스 컷 가운은 매력적이었다. 여기에 모자 디자이너 스티븐 존스의 펑키하고 독창적인 모자와 털이 북슬북슬한 커다란 파우치 백(밍크나 흑담비 모피 속에 스키압의 자물쇠가 파묻혔다)를 더해보라. 기발함이 승자가 될 수 있을까? 문제는 데이웨어였다. 커다란 어깨는 갑자기 70년대로 넘어가면서 섬세한 재단을 삼켜버리거나 여장 남자처럼 드라마틱해 보였다. 가령 어깨에 커다랗게 ‘ES’가 수놓인 채 바닥까지 내려오는 코트처럼. 프런트 로에는 자니니를 응원하러 온 아제딘 알라이아, 이네스 드 라 프레상쥬와 그녀의 딸 비올레트, 그리고 스키압의 부활을 후원 중인 디에고 델라 발레 등이 앉아 있었다. 꾸뛰르의 향기와 파리 공방의 장인들이 만들어낼 수 있는 최고의 날렵한 느낌은 완벽하게 성취됐다. 르사쥬의 정교한 은빛 자수, 메종 그리프와의 흥미로운 보석, 그리고 르마리에의 섬세한 깃털 같은 것들 말이다. 작은 부분들은 전체적인 느낌보다 더 효과적이었다. 그러나 쇼는 전체적으로 신선하고 기발하고 흥미로웠다. It was against all the rules: huge shoulders on fragile figures; puffed up sleeves of fox or sable; prints of lowly creatures like moths, rats and squirrels; and off-kilter colours for slithering silken dresses, with a dash of shocking pink velvet. 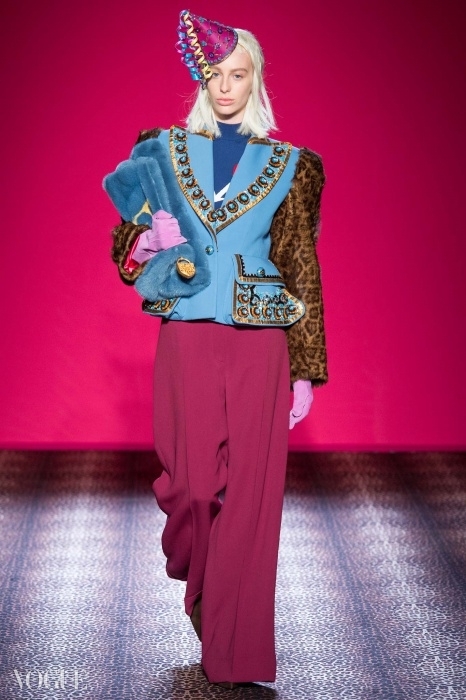 This was Elsa Schiaparelli revitalised by Marco Zanini – a review of the 1930s/40s woman from a feminist point of view. It was credible, striking, occasionally lovely and a big step forward from the flat animal print bootees of last season’s debut. ‘It is my personal view on Parisian chic,’ said Marco Zanini, explaining his vision of ‘Schiap’s’ sophisticated eye and her desire to encourage women to show their individuality. All that worked well for evening, which seems like Zanini’s forte. A satin dress falling like liquid over the body in a mix of hydrangea pink and mouse grey, or a bias-cut gown with squirrels scurrying over the surface, were charming. Add the funky and original hats of milliner Stephen Jones, and big furry pouch bags, a Schiap padlock buried in mink or sable. Can whimsy be a winner? 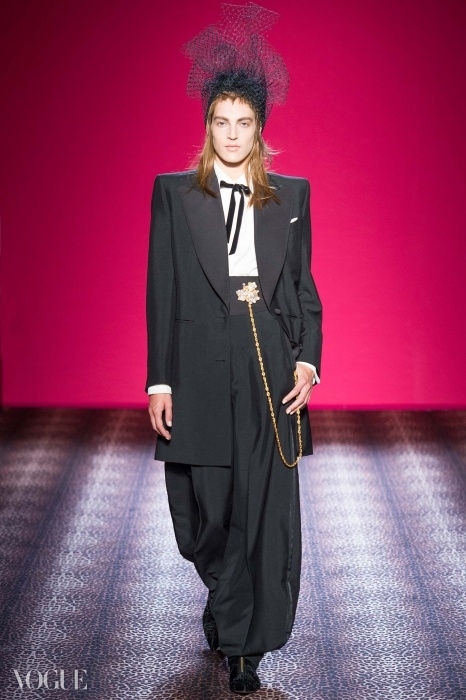 The problem was with the day clothes, where the giant shoulders suddenly turned 1970s and engulfed the fine cut, or looked drag queen dramatic, as in a coat sweeping the floor with a giant ‘ES’ embroidered at the shoulder. The front row, cheering Zanini on, included Azzedine Alaïa, Inès de la Fressange with her daughter Violette, and Diego Della Valle, who is behind the Schiap revival. What was perfectly achieved was the perfume of haute couture and the sense of the best nimble Paris fingers can create: exquisite silvered embroidery from Lesage; intriguing jewellery from Maison Gripoix; delicate feathers from Lemarié. The details were more effective than the sum of the parts. But the show felt fresh, quirky and interesting.